It a wonder what a change in the weather brings. The difference between this week and last week is remarkable. Last week we had 100+ heat index and a couple days ago I swear I woke up in October! Canada sending us some cool temps is a nice change, but I’m surprised on how much it effects the growth of produce. The beans are one example. Last week I was looking at our second planting and saying to myself, “That planting will be readily easily by next week” as flowers were turning to small beans. But when Maree and I went out last night to pick beans for the box, the crop was just not there since their growth slowed in the cool temps, so we ended up scouring our first planting of beans for this week. On the other hand, the slowdown was really nice for cool-loving crops. We have a third variety of broccoli called Imperial which has been putting on heads and this weather allows them to mature more slowly so you get a better formed head with nice tight kernals. This is unlike our second variety of broccoli which went form little buds to loose heads in about 2 days of really hot humid weather. This change in the weather is just a small example of how vegetable farming and CSA is particular is tough beast to plan for. We have a lot of well-laid plans in the spring, but generally you have to roll with the punches. Our trick is to raise a crazy variety of things, which, in the end, save us from bringing you a mostly-empty box one week. Something is bound to come in well no matter the weather. Fennel: I always feel like I’m challenging people on this one. I can just see people say, “What do I do with that?” Well, below we have a recipe which is really good. Still, you’ll also see fresh fennel listed in salads and soups. A mix of tomatoes: Hey, first of the season, so there aren’t a lot of any single variety. So there’s a smattering of different kinds. Serve plain as a side dish or over pasta. Can also be served over Italian bread that has been brushed with olive oil and toasted. In a medium frypan saute in 2 T. olive oil for a minute. Add and saute until tender, 5-10 minutes. Add and cook over medium heat until part of the liquid evaporates, 10 minutes. Salt and pepper to taste. I’m glad some members were able to make it out last week to pick some of the many peas still on the vine. 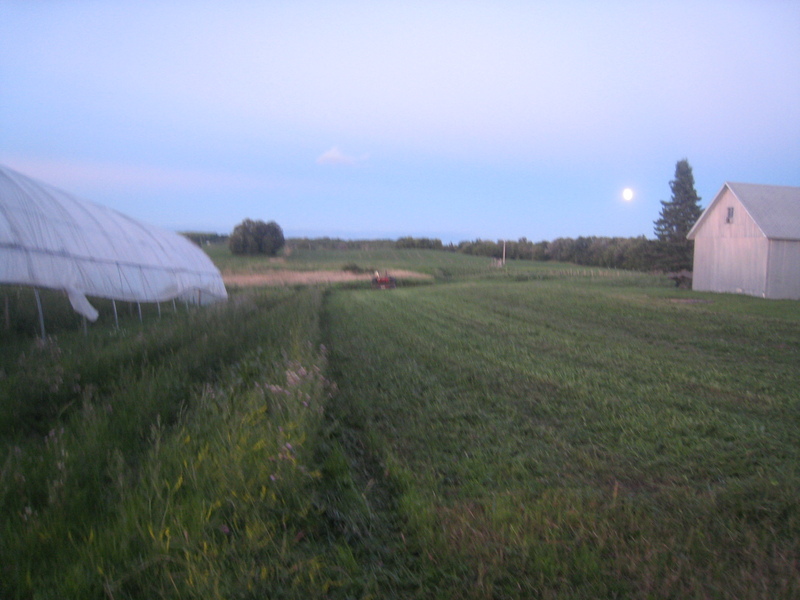 That field is now being prepared for fall carrots. Pea Field – yes, there are actually peas growing in there! 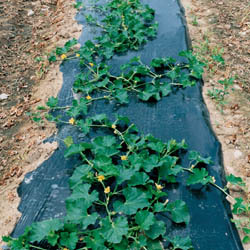 A very popular way of growing vegetables commercially today is in a plastic mulch. Sometimes called IRT for InfraRed Transmitting, it is a thin plastic which allows light through and it wide enough to to spread over a standard 6-foot bed. Maybe you’ve seen this. In our climate plastic mulches are used not only because you don’t have to worry about weeds, but, more importantly in my mind, they warm up the soil, and, hence, speed up the growth of plants. In an area with a really short growing season, this is pretty important, especially with heat-loving crops like melons. For me, however, I always “had it in” for plastic mulches because there is no way currently of recycling or re-using it; the plastic always ends up being a messy pile of muddy slop each fall which just needs to be thrown away. That’s why I haven’t use the stuff for the past 5 years. But this year I ended up planting some melon seeds really late and decided to use some plastic mulch because I was afraid they would never mature. Compared to the plants that went in the ground three weeks earlier, it’s no contest. The ones in the plastic mulch have about 5-foot vines which are now flowering and they others are sitting there only about twice as big as the day I planted them. A lot of this is still a symptom of the cool and wet spring, but I may just have to change my mind and accept the plastic in my life as a necessary evil to do melons and get them in the box that much earlier. Snap Peas: Edible pods, so don’t shell them. Green Cabbage: See recipe below. Spring Onions: Hard to believe I’m using the term ‘spring’ in middle July. A Kohlrabi: If you haven’t dealt with before, the most common thing is simply to peel, slice and eat as a little appetizer before supper – that’s how we do kohlrabi. Also the greens can be used in stir fry. We often make roasted cabbage in the oven at a high temp when it is cool in the fall. For summer, if you’re already firing up the grill, why not throw the cabbage on too? Preheat grill. Cut cabbage into 8 wedges. Place a cabbage wedge on a 12 in. square piece of foil. Dot with butter and sprinkle with seasoned salt. Fold in edges of foil to seal. Repeat with remaining wedges. Cook for 20-30 minutes, turning severeal times, until tender. Detroit Lakes. 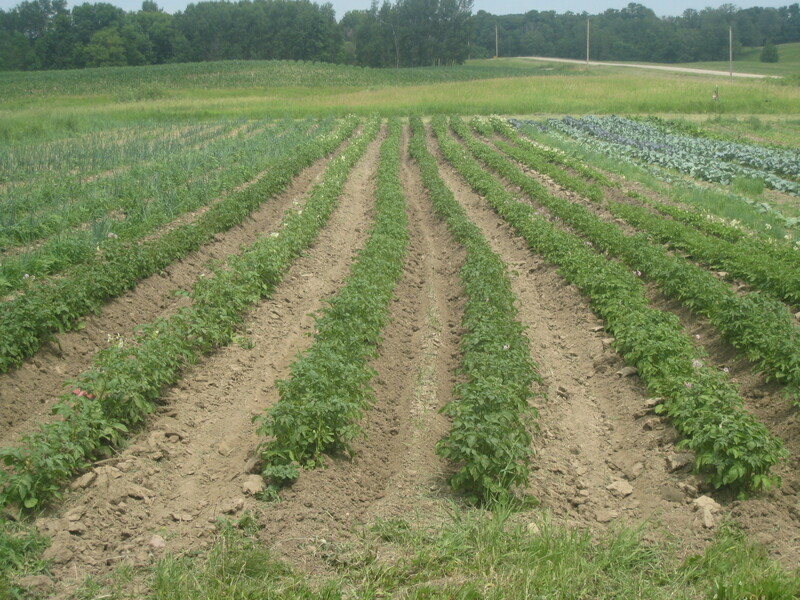 As you can see simply harvesting and driving around produce takes a fair amount of time, but, over and above all this, we have this time-crunch where we still need to weed, trellis tomatoes, feed and tend animals, and also plant for the fall. How do we keep track of all this, especially since I have a full-time job on top of all this? I have no idea. Thinking about it, I’m kind of surprised we make it though each year, although I don’t reflect when doing the work. Speaking of planting…it’s hard to believe, but we did start planting seeds for fall this week. I planted all our our fall brassicas like cabbage, broccoli, and cauliflower. 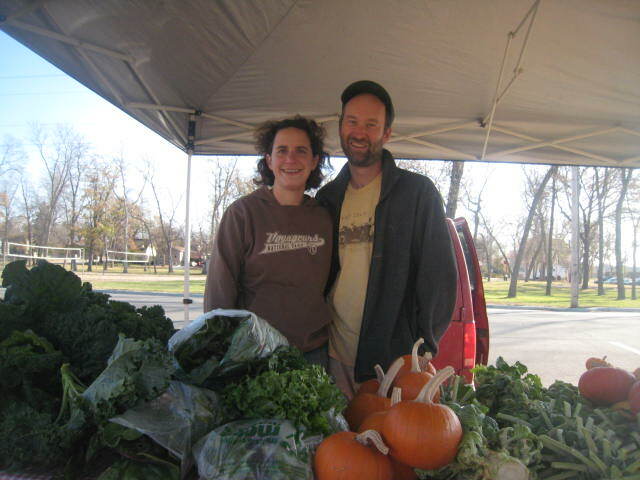 At lot of times people only think of these crops as products of spring, but, in actuality, brassicas and other cool-season crops like spinach and lettuce do much better in the fall where the days get shorter and we have consistently cool temps. Since it’s the summer, one trick we employ is laying burlap and row covers over the planted ground to get plants started in this hot and dry conditions. I just checked under the burlap this morning, and those fall brassicas are popping up out of the ground like crazy. It’s a long way to October it seems, but the plants are off to a great start. Kale: A majority received Lacinato (Dino) Kale which is dark green and bumpy in texture. Others received Red Russian Kale which is kind of frilly but red-green in color with purple stems. You use either type the same way (See recipe below). Green Garlic: This is fresh garlic before it has been dried down or cured. You can use the garlic fresh or simply leave in a dry location like your kitchen counter to dry and use later. Green garlic is a bit stronger in flavor than cured garlic and you’ll have to peel a bit more to find the clove. Snap Peas: Snap peas are an edible-pod variety, so please don’t shell them…it would be quite a waste. Just eat them. Romaine Lettuce: I know people are probably tired of lettuce…I promise to lay off as we move into summer crops. I know kale chips seem to be all the rage lately, but Maree and I just got into them last fall and they really area great! 2. Tear the kale into 3 inch pieces and put them in a large bowl. Toss with the olive oil and salt and pepper to taste, making sure the leaves are well coated with the oil. Arrange the leaves in a single layer on 2 baking sheets. 3. Bake until crisp, tossing once or twice, for 30 to 35 minutes. Serve at once. Keeping weeds under control is priority number one at Lida Farm this time of year. Now that the heat has finally come, all those weed seeds sitting in the wet ground have germinated, and, voila, a weed explosion hit the farm. Foxtail, lambsquarters, red root pigweed, wild buckwheat are popping up all over, so we’ve been throwing everything we have to keep the little barbarians from taking over. First we cultivate by tractor, then wheel hoe, then hand hoe, then, finally, weed by hand. 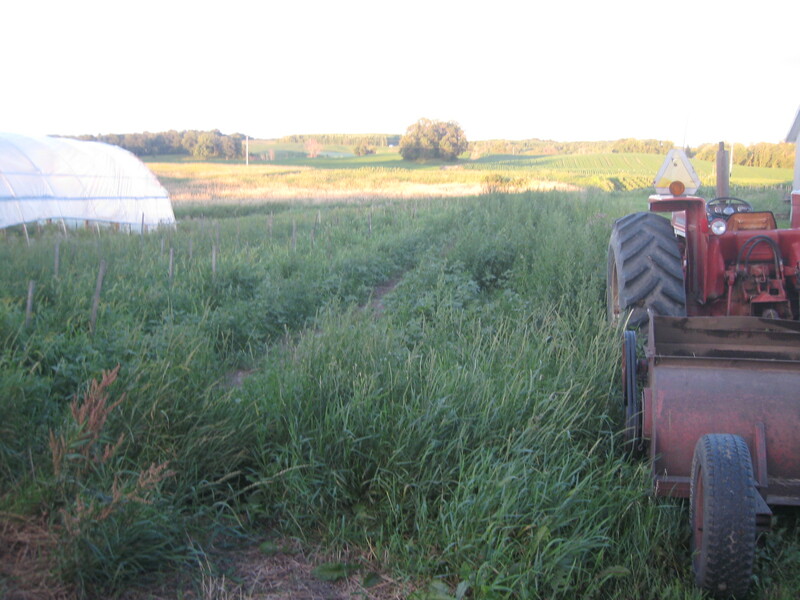 If you’ve ever feel like you can’t keep your garden free of weeds, imagine trying to do that over two and half acres where an acre is about 3/4 the size of a football field. Still, the battle against weeds isn’t constant drudgery; there are little things to celebrate along the way. One such milestone each year is the hilling of potatoes. Typically this is done in June before the plants think about flowering, but, this year being what it was, I only got the job done yesterday; the field was too wet and the plants were too small all June. For organic potatoes, we cultivate the crop twice by tractor and hoe so that the field is pretty clean of weeds before hilling. Since a lot of farming is a real mind game, it’s that image that matters most and why I just love hilling potatoes. When done, it just doesn’t feel like a little victory, but it’s a real beautiful sight. A Little Broccoli: This is just coming in, so some of these heads are not what I want them to be, but, hey.